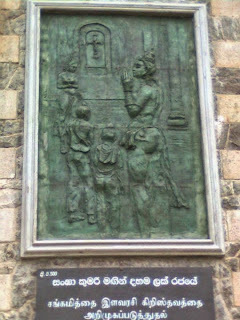 LankaWeb – Distortion of Buddhist’s History in Sri Lanka by Thewatta Church in Ragama is just a tip of a huge ice-burg! Distortion of Buddhist’s History in Sri Lanka by Thewatta Church in Ragama is just a tip of a huge ice-burg! As the Sinhala Bauddhaya highlights in one of its latest posts ThewattaChurch in Ragama has embarked on a monumental distortion campaign of history of Sinhalese Buddhists and re-writing a new history for Christians in Sri Lanka. Newly designed Wall-reliefs type of depictions in the Church show a history of Christianity in Sri Lanka going back to Anuradhapura era and King Mugalan was a Christian king! This is fittingly reinforced with Buddhist architecture in the Church! Eelamists have long been blamed for distorting Sinhalese Buddhist history in Sri Lanka for furthering their separatist agenda and this has been the case with Muslim extremists too in recent times. In both the cases false histories of both the communities are portrayed employing multitudes of ways. However, vested interested Christian and Catholic hierarchies have long been doing it in a sustained and vigorous manner in an extremely subtle fashion giving room for a little or no attention. Imitating and integrating Sri Lankan Buddhists cultural characteristics in whatever way possible into Christian/Catholic practices is one of the best ways to attract the Buddhists to the respective faiths. This is also one of most successful ways for conversions which have been happening vigorously in many part of the country especially in the poverty stricken rural areas as I highlighted in one of my earlier posts. 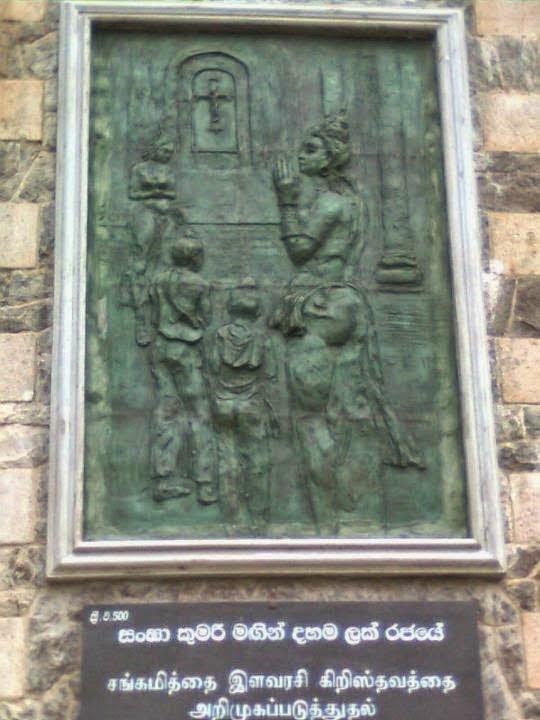 Claiming a history of Christians in Sri Lanka going back to as far as Anuradhapura era and not starting with the arrival of Portuguese colonists seem mere ridiculous to anyone who has an iota of knowledge of Sri Lanka: let alone her history. What we witness in Thewatta Church proves beyond doubt that this re-writing of history project for Christians isn’t mere an isolated incident. It is just a little sign of a determined, crafty and subtle effort which is in progress in a mammoth proportion! In a backdrop of Christian Churches in Europe get closed down and abandoned in large numbers due to dwindling followers and the region where Christianity was born is increasingly becoming a no-go and inhabitable zone to Christians, a new regions should be found for its survival. The most suitable regions are obviously poverty stricken regions of Africa and the South Asia. However, significant parts of the two regions are inhabited by the followers of Islam which gives a zero opportunity for conversions. The obvious choice is the regions where Buddhists and Hindus are in majority which offer a little or no resistance for conversions. So going to the extent of even completely distorting the histories of the indigenous communities and writing fabricated histories of Christianity in the regions should obviously be the order of the day. PS: What has happened to South-Korea which had an over 90 percent population of Buddhists at the start of Korean wars in 1950s is a case in point! Becoming Christians/Catholic equal being westernised/modern in developing countries ? Conversions give opportunities toward eduction in English and travel/jobs abroad ? Best thing to do is to give a good education in the English stream for those who want it, in Buddhist schools. Also, I don’t why an organisation like the BBS does not challenge the distortion of Lanka history, whoever who does that. Absolutely, the VERY “Best thing to do is to give a good education in the English stream for those who want it, in Buddhist schools.” And this I say as a Sinhala Buddhst Patriot who loves and treasures our Sri Lankan Cultural heritage! Recently, I added two more needy kids to my list of adopted children, that I am educating in Sri Lanka. One of them is a girl studying to take the GCE O/L exam in December. She is a very good and motivated student and she wants to be a Medical Doctor, so I am getting her all of the high-powered tuition she needs, in addition to her regular classes in school, to EXCEL at the exam! But WHY does she need all this help IF SHE IS A TOP STUDENT, help of the kind that I did not have when taking the GCE O-Level so long ago? The answer my friend is BLOWING IN THE WIND: I had the advantage of an English Education in a leading Colombo school with the best teachers and facilities! I thought that over half-a-century later the outstation schools have caught up. But, it appears, NOT SO! I was SHOCKED when I found out that this girl, the No. 1 student in her class in her outstation school in every class upto now, could barely write and speak in English. I foundout that her Science and Math eduucation were comparably poor! I decided that there was NO WAY that this girl can pass the GCE O/L in English although she is being praised to high heaven as the flagship student of her school. I found out she was getting a very good education in the humanities subjects including Sinhala and Buddhism, but was getting a very poor education in Math, Science and English … the very subjects she needs to Excel In if she wants to qualify for the Science Stream at the A-Level, and later get into Med School! What a LOOMING DISASTER I thought! Hence MY EMERGENCY ACTION to surround her with capable tuition teachers, the very best money can buy, with a simple directive from me: You are being teested as well; you will pass and be rewarded if you to help this girl get 10 A’s in the GCE O-Level so she can realize her dream. I have since discovered that tany poor kids in outstation schools are GETTING A TERRIBLY RAW DEAL of an education that leads them nowhere. Their ill educated teachers praise their admiring students to high heaven, bjut the students are NOT GETTING THE KNOWLEDGE to equip them to compete in society and the marketplace. Parents who can afford it are SPENDING LAVISHLY on getting THEIR children into the BEST SCHOOLS with the BEST TEACHERS and the BEST SCIENCE TEACHING FACILITIES, but the vast majority of our children are getting a raw deal and are being left behind. The stage is being set in the educational system to bifurcate Sri Lankan society AGAIN into HAVES and HAVE-NOTS through a flawed system of public education that discriminates against the poor and rural children, instead of levelling the playing field for all children whatever their personal circumstance are to excel in according to their native wit that is their birthright. It is giving birth to a system that sustains and reinforces inequality and the emergence of a rich professional elite dominating an ill educated majority destined to hew wood and draw water for them. These are the kinds of HIDDEN SOCIAL ILLS that will resurrect the next JVP Revolution …. and a storming of the Bastille in the near future. My God the STONE BLINDNESS that clouds the VISION of our people is TRULY AMAZING! Bravo! Jayawewa, President Mahinda Rajapaksa! Former President and UPFA Prime Ministerial Candidate Mahinda Rajapaksa said yesterday that there were no factions in the SLFP and the party would go ahead as one entity to defeat the common enemy, the UNP. He said that the SLFP-led UPFA would not form a national government after securing 117 seats in Parliament On August 17. Rajapaksa said that after obtaining 117 seats, the UPFA would form a strong government on its own. “The UNP has already admitted its defeat; it says it will form a government with the support of the Tamil National Alliance and the JVP after the general election,” the former President said. Rajapaksa said the TNA had already claimed self rule in the Northern Province, but a future UPFA government would not allow it. He said the youth who had not lived under a UNP government especially during the 1987–90 period, now had realised what it was like during the past six months or so. Rajapaksa said that JVP, too, worked together with the UNP today as rightly mentioned by its former leader Somawansa Amarasinghe, forgetting the mass killings of JVP members under the then UNP government. The former President said that the next UPFA government would restart the Moragahakanda irrigation project which had been suspended by the present government. Rajapaksa said though the UNP criticised his government for obtaining loans the Wickremesinghe administration had drawn more loans during the past six months. “We will provide drinking water to all households as well as electricity,” Rajapaksa said, adding that they would continue the fertilizer subsidy and introduce a Rs. 500,000 loan for self-employed at a low interest. “We will increase Mahapola upto Rs. 6,000 after August 17. More than 1.5 million people who lost their employment due to stoppage of development projects would be re-instated and all those projects restarted forthwith. Former Chief Justice Sarath N. Silva, Former Minister Wimal Weerawansa and Matale District SLFP leader Janaka Bandara Tennakoon, former minister Rohana Dissanayake, former deputy minister Laxman Wasantha Perera and several UPFA candidates also spoke at the rally. Former Minister Nandimithra Ekanayake, who resigned from the Rajapaksa government and joined President Maithripala Sirisena was also on stage with former President Rajapaksa. He, too, addressed the rally. Thank you so much for the great good work you are doing with local kids who need help in their education. You and similar thinking and acting people are the modern day heroes of Lanka ! Well done – we are proud of you ! Yes, I do agree that EDUCATION is the key to give hope and growth to Lanka. Mahinda Rajapakse knows this well too, judging from the brief releases of the UPFA Manifesto. Indeed we have to strive hard to avoid future social strife in Lanka, communal or otherwise. May all children be wanted and loved here. On behalf of all right thinking people of Lanka, we thank you again for wonderful efforts. There are good Christians and bad ones. It is the bad ones who are involved in this dastardly attempt to subvert our history by bringing in utter untruths. If there are good Christians, they must know that they are surreptitiously intruding into falsehoods. If this is the way Christianity has to survive then what good can one expect from such a religion. The other aspect is that it is the Christian Church which is promoting this untruth. This shows that they have a clear agenda to intrude into the Buddhist heartland by subterfuge. This all started long years ago and it took a major turn in the sixties when they gave away with the Latin version and started to go vernacular. All this happened after the second Vatical Council of Pope Paul VI. It was after this the Christians stated giving Buddhist sounding names to their offspring. Names such as Maithri, Muditha etc used to appear among Christians. Thewatte Church is Ragama has no shame! I can write a whole lot on this Church which has no shame. It is the Church of the Mammon and nothing else. Always finding ways to enrich herself at the expense of other religions. They have a dwindling congregations and now they are eying Asia. This is the reason that Pope John Paul II proclaimed 21st Century as the century for evangelising Asia. Majority of Europeans, Australians and New Zealanders do not go to church. Most of their churches are now serviced and attended only by recent migrants. Some churches are up for sale and some even have become Mosques. This is the reason the Christian Church is sneaking into other cultural space not very different from the Racist Tamils invading Sinhala land. Among other things the Catholic Church is involved in pedophilia, money laundering, human smuggling and even the drug pushing. It has paid millions to silence her victims while still amassing wealth at the expense of the poor. Every time a Pope visits a country that country is left more impoverished than before. This entry was posted on Monday, July 27th, 2015. You can follow any responses to this entry through the RSS 2.0 feed. You can skip to the end and leave a response.